How to play guitar with Dodeka Music? 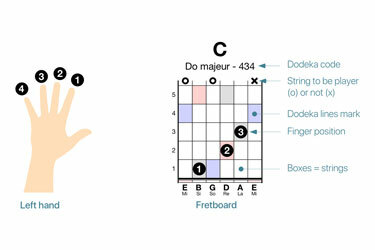 Dodeka alternative music notation and easy-to-read sheet music work with every instrument, inlcuding guitars. With conventional music notation, it’s quite hard to read note but it’s even more difficult to read and play at the same time the right notes on the six strings of the guitar. To overcome this issue, many musicians and guitarists learn to play guitar by only using tabs, or tablatures. They basically learn where to put their fingers on the strings to produce the right sound. Yet, with tabs guitarists may play music without really knowing what the notes they play. As a result, it’s quite difficult for them to play and reproduce melodic parts and/or classical pieces. But what about playing tabs and knowing the notes you play at the same time? That’s what Dodeka Music offers with its new tabs: the Dodeka tabs. 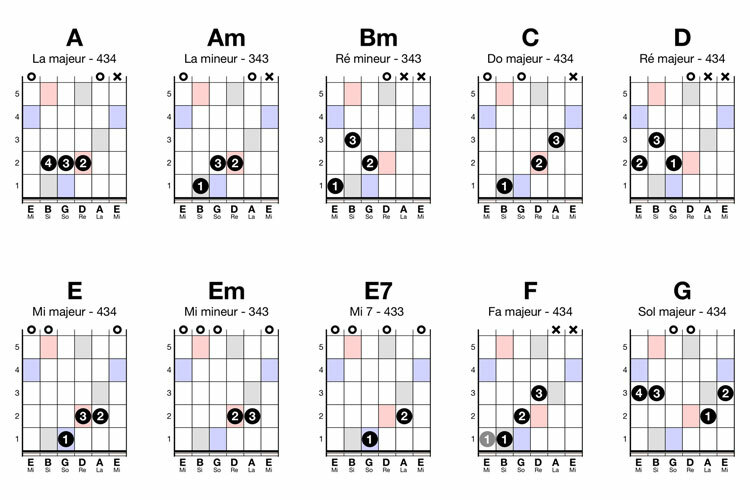 Dodeka tabs allow everyone to play chords while knowing the exact note he/she plays. The Dodeka Tabs add a new dimension to tabs. What’s on a tab now connects with what’s on the notation. 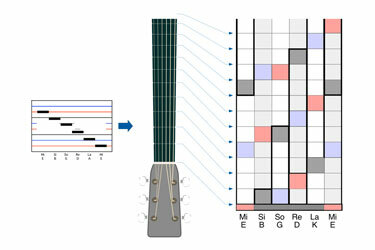 The 4 lines of the Dodeka music notation are visually indicated through coloured boxes. This is basically the same principle as what you find on the Dodeka keyboard design. (For more information on this principle, please visit the Dodeka keyboard page). So now with these visual cues, not only can you very easily know the value/pitch of these four notes (i.e. C / E / P / E), but you can also deduce the pitches of the other notes by looking at their position compared to the 4 marks. You basically check whether the notes are above, below or between these marks. This is the exact same principle as what you've got on the Dodeka keyboard. To make the note recognition process even simpler, it is also possible to add visual cues on the guitar fretboard. For that we offer a set of stickers that you can paste on your guitar. Simultaneously, we are also planning to offer quality guitars that will come with these marks in the coming future. If you are interested by either the DIY-kit or the guitar, please reach out to us. We would be happy to give you some more information about them. 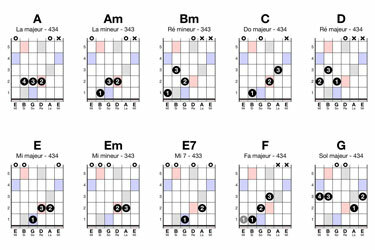 Here is a quick list of some chords in Dodeka tabs. A pdf version is available for download at the bottom of the page. Download Dodeka tabs list for guitar here. Have a question? Want to help? Share an idea?